US President officially renews sanctions on Iran following withdrawal from nuclear agreement. Trump remains open to negotiations. US President Donald Trump signed an executive order officially reinstating US sanctions against Iran Monday. 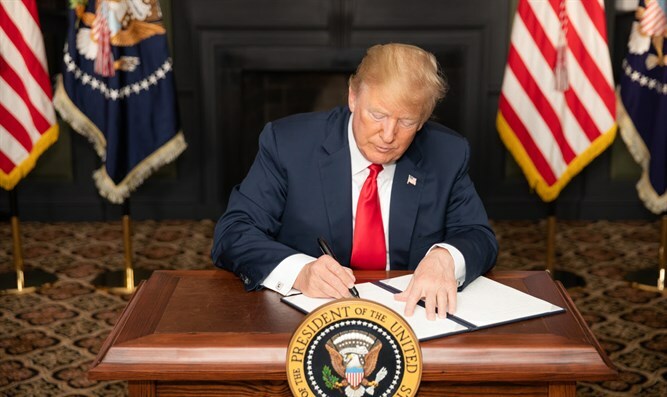 The order marks the first round of sanctions to be imposed on Iran following Trump's withdrawal from the 2015 nuclear agreement in May. The sanctions target Iran's access to American dollars and steel and automobile industries, ban trade with Iran in gold and other precious metals, and include other sanctions which were lifted under the 2015 deal. The second round of sanctions will take effect on November 4, 180 days after the US withdrew from the agreement. Those sanctions will target Iran's oil and shipping industries. A senior administration official said that the sanctions “supports the president’s decision to impose significant financial pressure,” the Washington Times reported. “This administration intends to fully enforce our sanctions … to stop its destabilizing activity,” the official added. President Trump said that the renewal of sanctions did not preclude the possibility of negotiating a new nuclear deal with the Islamic republic. “I remain open to reaching a more comprehensive deal that addresses the full range of the regime’s malign activities, including its ballistic missile program and its support for terrorism,” Trump said after signing the order. Israeli officials praised the move. Earlier, Defense Minister Avigdor Liberman tweeted: "Tonight, the sanctions imposed by the American administration on Iran will enter into force. In a courageous decision that will be remembered for generations, US President Donald Trump has changed direction with regard to Iran. No more agreements and obsequiousness, but a determined struggle to stop the murderous ayatollahs regime, which spreads terror, violence and hatred throughout the Middle East." Education Minister Naftali Bennett wrote: "I congratulate @POTUS @realDonaldTrump for his brave stand against Iran’s tyrannous regime. The sanctions stand as a lesson to Iran’s leaders and the whole world. Iran must end its genocidal ambitions, & its spread of hatred, instability, & terror across the region." The US sanctions have taken their toll on the Iranian economy even before going into effect. Last week, the Iranian rial plunged to a record low of less than 1,000 to the American dollar.